My bespoke research service is a flexible way to find out about your ancestors. I can start from scratch, uncovering the details of your unknown ancestors’ lives; or I can help you to extend or review your own research. to solve a family mystery or investigate a family myth. You will receive a report telling you about your ancestors, including details of the sources used, conclusions about the discoveries and recommendations of next steps. When I can I add photographs and local information to my reports to help illustrate the lives of your forebears. I interpret the records, as well as providing you with copies of them when I can. How much does it cost? For a special gift, receive your family history as a story in a smart hardback binder, with photographs and copies of original census entries. This makes a great gift for special birthdays or anniversaries. I will also carry out look-ups and take on smaller projects, for example to find and copy a source from my local archive office. For my prices, see How much does it cost to trace a family tree. 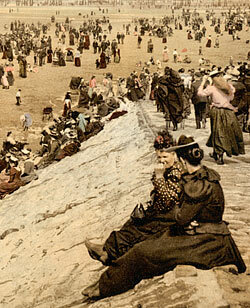 Victorian Blackpool. This colour picture was taken in c1890 using photomechanical print.